Well, we've done some re-vamping of our Thursday morning storytimes. Instead of doing 3 programs aimed at 2-5 year olds, we're doing 1 for 2-3s and 2 for 3-5s. We're not carding at the door or anything, but the programs will be slightly different. So, now I'm doing the 2-3s every few weeks. This is slightly different than a regular preschool storytime because the stories are shorter and you need to do more action rhymes and songs. I love the bright colors and African plains animals in the is one. It's also a great book about wanting it to rain and works the senses in really well. I love the paper-cut out illustrations. Rain is failling down. SPLASH! Sun is peeking out. Peek. Another one with great paper cut out illustrations. How can you not love Javaka Steptoe? Then we made a rainstorm-- have everyone rub their hands together, then snap their fingers, then slap their thighs, then slap thighs AND stomp their feet. BOOM! BOOM! BOOM! Then we stop stomping, then we go back to snapping, then we rub our hands together and then all is quiet and the sun comes out! I love the pattern in these illustrations as people and animals wait and wait for the rain they need. It also goes through the days of the week. Today I switched shifts with a co-worker, so I wasn't here to do baby storytime. BUT! I was here to do Family Storytime. As Wednesday nights are never part of my regular schedule, I very rarely get to do this storytime which is for kids ages 2-9. That's quite an age range, so it's hard to prep! Luckily every time I've done this one, it's a bit last minute so someone else has already prepped it. This is fun because it follows the sheep-to-sweater arc, with good rhyme (often in the middle of a sentence, but done well) and a silly ending. This is a nice way to work nonfiction in. 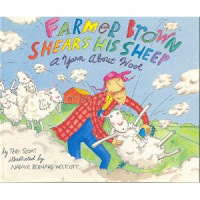 It's a small book, so it won't work for large crowds or big rooms, but it followed up Farmer Brown Shears his Sheep nicely, filling in more detail about what was going on. Very silly. The kids quickly caught on to the refrain of "But where is the green sheep?" and recited it along with me. Very fun. I have a flannel board with a black sheep. Then he gets a red fleece coat (his head and legs stay the same) so we sing Baa Baa Red Sheep. I have lots of colors, including "stripey" and "spotty"
Silly and short and very fun to read. I had other stories about sheep and nonfiction books about sheep on display for people to check out, as well as extra copies of the books I read. It went well and we had a good time. It's hard to fill in for a familiar librarian. Even though I've worked here for over 5 years, most of the Wednesday night crowd has NO IDEA who I am, so I was a bit nervous. Also, in heart-warming news, my baby storytime moms were very worried about me this morning! They kept asking my co-worker if I was alright because I wasn't there! She had to reassure them many times that I was fine and doing her a favor by switching shifts and I'd be in later. A few weeks ago was my week to do preschool storytime. I had everything ready to go with a fun, if odd, theme of RUBBER DUCKS! We only did three stories because Baby Duck's New Friend is kinda long. Unfortunately, I did these storytimes awhile ago, so I can't remember which books I had out for extra display. Eep! If you're new around here, my Introduction to Baby Storytime will make this post make more sense. This is the storytime that I prepped that no one showed up for. Even though my hand-outs all said 3/30, they were handed out on 4/6. That may be a little confusing, but I had already printed them out and didn't want to change the date and reprint them-- too much wasted paper. Ollie the Stomper is a picture-book-turned-board-book. It has an actual plot! It's a little longer than most board books, but there's still a very low text-to-page spread ratio and I think it works well, especailly if you stomp your feet every time Ollie does. We read it after "Hickory Dickory Dock." Look at Baby's House is much shorter and highlights common daily activities. Babies really respond to the chunky black-and-white illustrations. (This is because their eyes aren't totally developed yet.) Personally, I like how the bright aqua accents the illustrations. Not sure the babies appreciate it the same way, but I do! We read it after we sang "Shake My Sillies Out" which happens after "This is the Way the Ladies Ride."